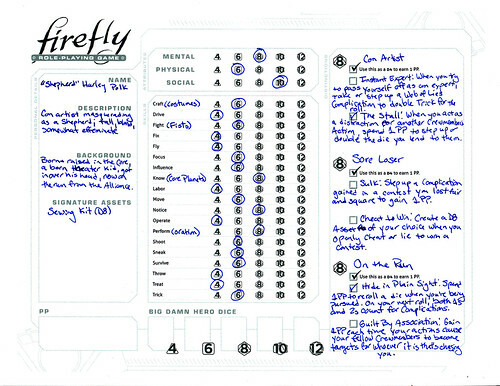 Maragaret Weis Productions recently released a new Firefly RPG. And we're suckers for the setting. It uses the Cortex Plus system, and so is radically different from the Serenity RPG that Steph made a character for waaaaaay back when. Seriously. It was that fast. This game has some of the fastest character generation I've seen. I wasn't fighting the game, and the process gave me some ideas to make my character better. This is interesting, because a large part of character generation is choosing templates. The game calls them "Distinctions," and they are a factor in play - they give you more dice to roll. And I have to partially disagree with this - with a d6 Fight and a specialization in Fists, I think "Shepherd" Polk would do better in a fistfight than Steph suspects. And his d6 in Shoot won't hurt, either. Short of something in the vein of Feng Shui or Talislanta, I don't think she's likely to find much easier character generation out there. It’d be nice to know up-front how many points I have to spend in the different areas. The Signature Assets and Skill Specializations aren't explained up-front - they tell you what they are in loving detail and then tell you how much you can spend on them. I love Firefly, and have been hearing good things about this game. And not just from me, either. This game has been getting pretty rave reviews just about everywhere. Much easier across the board. I really liked having the archetypes to refer to, as they gave me a good sense of what a character should look like. Before telling players how to make their own characters, they have a dozen or so excellent examples of characters in addition to the cast of the TV series. Yep. From one of the easiest games to make a character that we own to one of the more difficult. I'm actually very curious what sort of BW character she'd come up with.